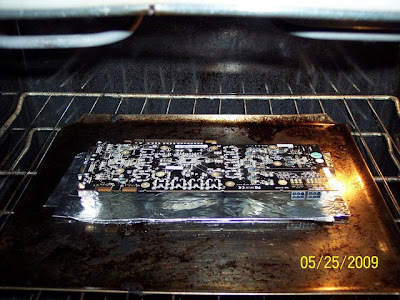 sooooooo, i removed all bits from the card including the i/o shield and placed it gpu side down with the card raised up on 3 sides by tiny balls of aluminum foil and placed it on a very thin cookie sheet. i preheated the oven to 385f, put the card in and waited around 8-10 minutes. i carefully removed the cookie sheet and placed it on top of the oven to cool down naturally. waited about an hour and voila! "